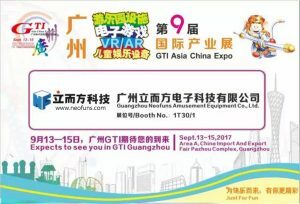 The GTI Asia China Expo, which has been successfully held for the first time since its inception in 2009. The 9th session will be held in Area A, China import and export fair Pazhou complex, Guangzhou on September 13, 2017. GIT Guangzhou is committed to diversified development, integration of entertainment industry, including video games, children’s entertainment equipment, amusement park facilities, large outdoor equipment, VR / AR equipment five main areas, and related derivative industry chain. It has been an unprecedented scale of response, to attract a number of countries around the world to come to the exhibition, that for the global buyers to provide a good purchase meal. Neofuns Amusement Equipment Co., Ltd (Abbreviations: Neofuns)is invited by the organizers and take part in on time. Neofuns is a 14-years professional manufacturers of prize&merchandise, has been “Neofuns creates fun for the world ” for the purpose of, so that people always feel the joy of amusement equipment. The exhibition, Neofuns will show all new products this year, including Prize Vending Games: Cut ur prize, Good Catcher; Crane Machines, Redemption Games: Ultimate Big Punch Prize Machine, Shooting Hoops and so on. Our booth number: 1T30 / 1, then welcome new and old friends at home and abroad visit the site to communicate.